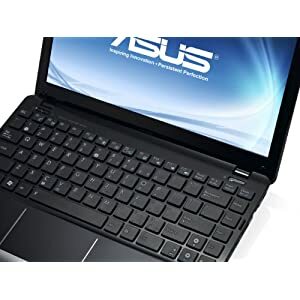 The ASUS Eee PC 1215B-PU17 is a netbook that is targeted at a mobile entertainment segment. With a powerful dual-core AMD Brazos E350 processor and a dedicated AMD Mobility Radeon HD 6310 graphics, this netbook is equipped specifically to be able to handle high definitions movies and games. This 12inch netbook borders on being an ultraportable and can easily be called a notebook given its powerful setup. Its 12.1-inch WXGA LED display with a native resolution of 1366×768 can easily display HD movies at 720p. Its graphics engine can handle full 1080p HD videos and the netbook can then stream the contents to a HDTV or a compatible external display via the built in HDMI out. It even has a USB 3.0 port for high-speed transfers. The built in graphics engine supports DirectX 11, which makes it a decent gaming machine. It can handle most of the modern 3D games and play them at average to good FPS rates. The Eee PC 1215B-P’s memory is a small let down — 2GB DDR2 but it can still handle most of the tasks that you will be throwing at it. It is expandable up to 4GB and it’s a good idea for most gamers to upgrade to take full advantage of the graphics chip and processor. It comes bundled with Windows 7 Home Premium, which takes care of all the necessities of the average user. The larger chassis enables the laptop to make room for larger palm rests, which is a welcome addition. The touchpad has the same finish and color as the rest of the laptop exterior and has a single bar style click button. It is multitouch enabled and supports gestures for zooming and other things. The keyboard has Chiclet style keys, which make typing more comfortable. The layout is edged to edge in order to make full utilization of the space. The 1215B-P comes with a 320GB 5400RPM HDD storage along with a complimentary unlimited cloud storage option from ASUS. It is a 60day complimentary service that you will then have to pay for to continue with. On the connectivity front, the netbook packs in Wireless-N WiFi standard to take advantage of modern high-speed network routers along with backwards compatibility for 802.11b/g. Even though it operates over the 2.4GHz frequency, which some customers prefer to be 5GHz, it still supports high-speed wireless connectivity and data transfer through most of the common wireless routers. It also features a Gigabit LAN port (10/100/1000) for high speed LAN connectivity. Battery life is rated at 8 hours but only with average usage. Watching HD movies and playing 3D games will cut it down to about 3-4 hours or less. Overall, Eee PC 1215B-PU17 netbook focuses on being fast and efficient when it comes to entertainment and moderate gaming. Consumers overall have very positive reviews to give with some report successful upgrades to 8GB RAM. There are some complaints regarding the touchpad, which is a common problem to most Eee PC models. Driver upgrades fixed the issue in most cases though. Asus is one of the many companies who are getting ready to upgrade their netbook line with the new Atom N550 dual core chip. But they are also a company who seem to be having some trouble keeping a lid on it. So both today and yesterday, details about their new dual core netbook have leaked on the internet. They are going to bring out their first Atom N550 netbook in the form of the Eee PC 1015PE. The Eee PC 1015PE will be the first netbook from Asus to have the Atom N550 and will also have certain other extras that will push it in to the next generation of netbooks. According to details fished out of the official product page that accidentally went online for a brief few hours, the 1015PE will support DDR3 memory, thus having a much better performance rate. Also new would be support for both Bluetooth 3.0 and USB 3.0 standards. The Atom N550 will be in the form of a 1.5GHz dual core processor. It will come with three options for the battery — 48Whr, 56Whr, and 63Whr — which will provide for 10, 11 and 13 hours of battery life respectively. At least that is what Asus claims the performance would be like. Other than these features, everything else seems to be pretty standard with the netbook. It will have a 10inch display with a native resolution of 1024 x 600. Even with DDR3 onboard, it will have only 1GB of memory and will run Windows 7 Starter Edition at purchase. The Atom N550 is not the first dual core processor in this line but the last one was not meant for portables due to the amount of power it consumed. This new model is deemed fit for netbook use and said to be high performance while still only sipping from the battery reserve. Just before CeBit 2010 hit the tech crowd, Asus’ latest crop of Eee PC models have leaked all over the internet. These are three new models that Asus is expected to debut at the CeBit show. The leak has been courtesy of Blogee, who is the source who claims the existence of these models. The leaks is a pretty good one actually — complete with pictures of the alleged models. I only say alleged because it is not official yet and there hasn’t been another such story but this rings pretty true. So start planning if you are in the market for a netbook. The three models are — 1018P, 1016P and 1015P. These are all Pinetrail toting models, if there ever was a doubt about that. The 1015P is apparently a refresh of the 1005P model, with the newer additions being a larger touchpad and an aluminum shell. The matte seems to remain intact. The photo shows as much. There aren’t any photos of the 1016P but it is supposed to have a business focus. Let’s hope that does not mean a premium finish and Windows XP. That is so totally not a great thing to do. It will apparently have chiclet keys, aluminum chassis and a squared off design. No ThinkPad obviously but just might do. The 1018P is apparently only 18mm thin and is supposed to be the thinnest netbook that Asus has ever made. It is also tipped to have a USB 3.0 port and a finger print scanner. My verdict — it will charge you a lot for things you will have no use for. The 1015P and the 1016P are both expected to have a battery life of 14 hours, without the wireless on that is. The 1018P is supposed to last 10 hours, which again is pretty decent if you ask me.